San Diego-based Sempra Energy reported Thursday its annual earnings increased 16 percent in 2014 to $1.16 billion, or $4.63 per share, compared to $1 billion, or $4.01 per share, in 2013. The energy services holding company is the parent of San Diego Gas & Electric Co. and Southern California Gas Co. The 2014 results included $21 million in charges related to the early closure of the San Onofre Nuclear Generating Station, including $12 million in the fourth quarter. Sempra’s 2013 results included $77 million from the retroactive impact of a rate case, offset by a $119 million charge related to the San Onofre closure. Excluding these amounts, Sempra’s adjusted earnings in 2014 were $1.18 billion, or $4.71 per share, up from adjusted earnings of $1.04 billion, or $4.18 per share, in 2013. Revenue increased to $11.03 billion from $10.56 billion the previous year. Sempra’s fourth-quarter earnings increased to $297 million, or $1.18 per share, from $282 million, or $1.13 per share, in 2013. Excluding the San Onofre charge in the fourth quarter 2014, Sempra’s adjusted earnings in the fourth quarter 2014 were $309 million, or $1.23 per share. Revenue for the quarter was $2.75 billion, up from $2.70 billion in the same quarter of 2013. Last week, Sempra’s board of directors approved a 6-percent increase in the company’s annualized dividend to $2.80 per share from $2.64 per share. The company forecast that earnings per share in 2015 would be in the range of $4.60 to $5. 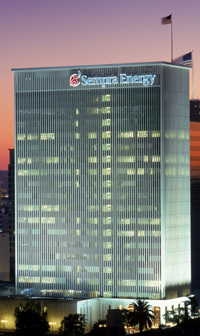 Sempra Energy is a Fortune 500 company with 17,000 employees serving more than 32 million consumers worldwide. Posted in Business | Tagged Debra L. Reed, earnings, San Diego Gas & Electric Co., Sempra Energy, Southern California Gas Co.